Definitely probably not the direction I'll go in, just something I was messing with in the last few minutes to see how small I could make these special characters. 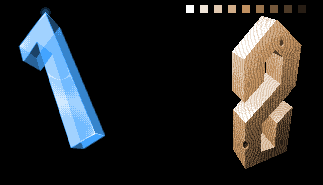 I was trying for 3x4 pixels each, uniform size, and it was working out fairly well until I got to the @ and &. Also the 8 which I haven't really worked on yet, but I like how the 2 was coming out. It looks a little blurry though, but looks like a 2 to me. But yeah, I think I'll be making something much more stylized and not just a super optimized tiny font. How strict is the no letters rule? Can I use letters in the piece if it's not part of the main font in focus? for example, a 5 pixel high font for letters, and a 20 pixel high font for the characters asked for in the challenge, or should I just use binary to type the message I want? Cannot resist a typographic challenge. Keeping it simple and slanted. Looks like you guys got your work cut out for ya, if Jinn has anything to say about it. I'm not quite sure on the @ or the &, but I feel happy with the overall style. Definitely prefer this one. It's a lot cleaner than the other style you made. Yeah,I'm going to work at a larger scale to put in more detail. What is up with your formatting? I was talking about all this. @WolfKit: What do I mean by formatting? My English is not very good ... Sorry. @Jinn Not much to criticise; it looks fantastic.Reminds me of the old how to count children's books. I'm not sure how your going to pull of that walrus 0 though. @ Jinn: I'd say shorten the leg of the 4 (or heighten the top, or both) as the top part of a 4 is usually larger, as seen in this sentence. Also, because the shading of 8 moves the bottom of the hair into the background, it loses the crisp outline of being an 8, so I'd say brighten the bottom of the hair a little. But that's just me reaching for critiques 'cause you asked for them. Excellent piece, I wouldn't have thought of that for this challenge. Progress so far, palette could probably be improved, and a shiny animation would be nice, but I'm not sure if I have the skill or patience. They're supposed to be made of little metal blocks, if it wasn't apparent. I've drawn up the others but haven't pixeled them yet; maybe I'll do extra. I'm thinking this is more a usable font than anything. If I have the patience I may return after the challenge to add the alphabet; would you want it? Hi, I have begun new font, it is in an early stage, what do you think? I think that's great :) I like the red and white one best though. It's cleaner and the style is very consistent. A bit of anti aliasing between the red and white would be a good idea imo. Also, 2 was missing the side of the curved section, so I put that in. Thanks a lot for feedback :) I am quite surprised that you like the red-white font, it was just base for the other ones. @ Mhyre, here's a quick edit for you: I think that's how the 3 should look, given the perspective, although I think the top might be one pixel thinner than the tops of 1 and 2, but I didn't even want to try changing that :SAlso, 2 was missing the side of the curved section, so I put that in. That's what I thought. Thanks for the help! I don't think I will finish it anyway, given the time left for the weekly challenge! ok, seems quite dead for me, 5h and only 1,5 made..
Maybe try for some simpler rendering for the challenge, then continue to work on this later. I think you are right Shamocore, I was crazy to think I can do this in time. I'm gonna find something else to finish these fonts, I post my last version of this anyway, my original idea was to make a different material for each one.